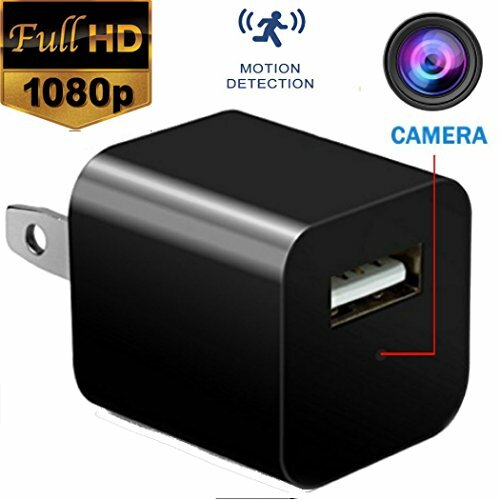 Mini Hidden Camera, Spy Vision HD 1080P Wall Charger Camera/Nanny Mini Camera, Security Camera. Can Charge Phone While Recording. 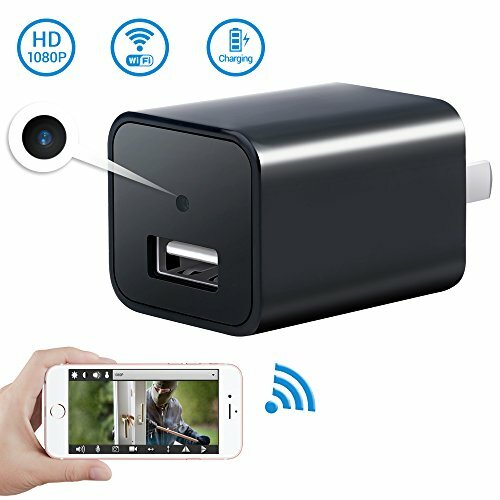 TWO IN ONE CHARGER & CAMERA: The USB wall charger built in 1080P HD lens, you can use it as an adapter for charging, also as a hidden camera, nobody will realized this is a mini camera, highly recommend it to the ones who want to surveillance home or office security without any notice. 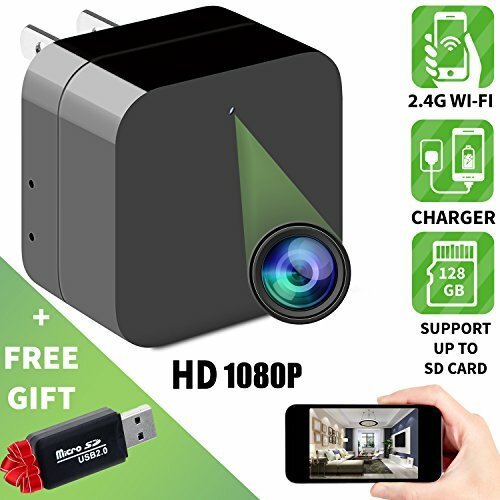 1080P HD Video: This hidden video camera shoots video at 1080p at 30 frames per second with a bit rate of approximately 24mbs. You can playback the captured footage and copy video from the LARGE 32GB Memory(not included) EASY TO SETUP: The Hidden Camera is ready to go out of the box. It can be used in just one easy step, doesn¡¯t require any settings or special set up, insert the micro SD card. 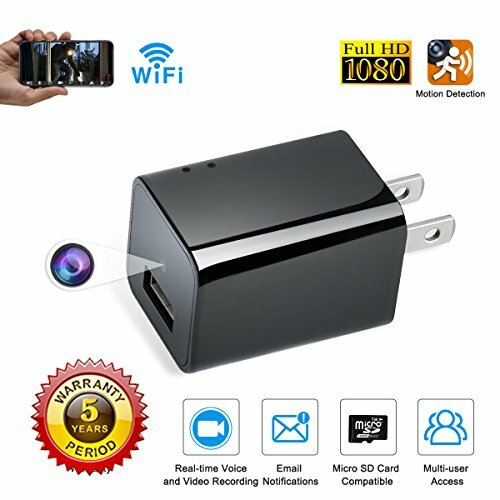 MULTIPLE USES: The hidden camera is definitely a perfect tool for monitoring the performance of babysitter or recording the pet¡¯s activities while you go outside. As the same time, it can work for your phone with charging. 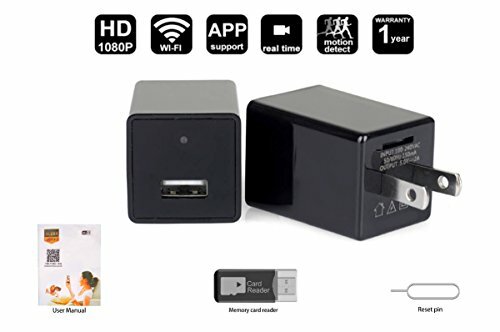 Our hidden spy camera adapter plus USB wall charger is smartly designed device that contains the ability of multi-functioning. It charges the device that is plugged in within, and additionally records video or the surrounding. It allows you to keep a check of that specific place when you are not around. Hence providing a sense of security in your absence. Its flexible nature allows it be used wherever needed, all you have to do is plug it in! 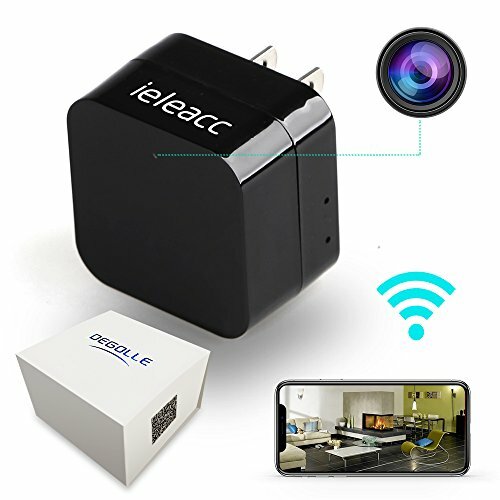 Package includes:1 x Full HD 1080p USB wall charger camera1 x Memory card reader1 x English manual Micro SD card is not included! WIFI & Motion Detection Capability: WIFI - Have the ability to stream live video footage on your smart phone of what's happening anytime & anywhere. KNOW EXACTLY what is happening in your home when you are away. Monitoring is just a touch away. 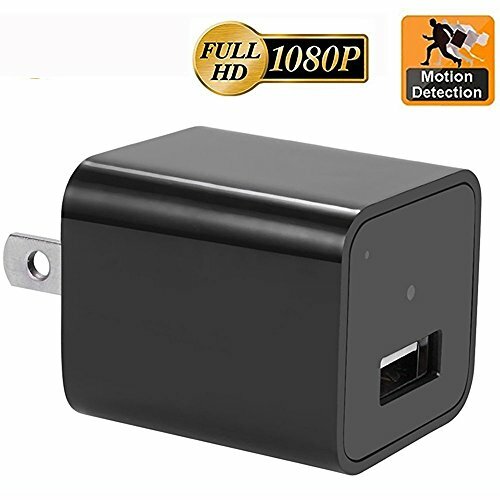 Motion Detection - Record what's important and not the blank footages (Can also support 64GB Micro SD Card)Record crucial footages and save storage memory. 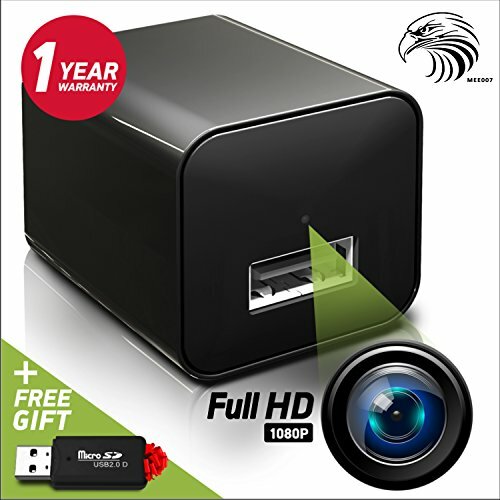 Easy To Use: Hidden Camera comes ready to use right out of the box - Just Plug and Play! Use The Camera For: Security Surveillance Nanny Cam Office Surveillance Home Surveillance Hotel Surveillance USB Wall Charger What's Included: x1 - 64 GB Full HD 1080P USB Wall Charger Hidden Camera x1 - Users Manual x1 - USB Card Readerx1 - Reset Pin Requirements: Wall outlet Mobile Device Mobile Application (included) 2.4GHz Internet router Thank you for your support~! 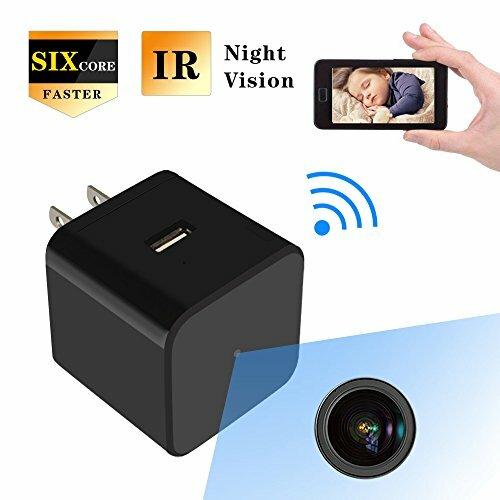 HD 1080P Hidden Spy Camera USB Wall Charger Mini WIFI Home Security Wireless Nanny Baby Pet Cam with Audio IR Night Vision Motion Detection. Special Note: The camera is supported a 2.4ghz and it does not support 5ghz networks. The camera is charging and recording at the same time,so the camera is hotter than the other electronics.This is a normal situation. Please don't worry Features: Surveillance Monitoring. Using the camera as a baby monitor, nanny camera, pet monitor to make sure everything are safe and healthy in your cares.Surveillance Monitoring your home,office or other indoor Specification: Video Format:AVI Wifi Effective Radius:30M Video Coding: H.264 Resolution:1920*1080P/1080*720/640*480 Video Frame Rate:15-30fps Storage:micro SD card,up to 64G（not included） Power Output: DC5V, 2A Image Ratio:4:3 Computer Operating System:Windows/Mac OS X Mobile Phone Operating System:Android/iOS Web browser:IE7 and above,chrome,firefox safari.etc Real Charger adapter but without Night vision Package: 1x Wall Charger Camera 1x User Manual 1x Card Reader 1x PC client CD 1x Reset pin Seller Warranty: 12 Month Warranty Lifetime Support Provided If for any reason you are unhappy with any product by SOOSPY, please do not hesitate to contact us：[email protected] If you're looking for the market leading WiFi Wall Charger Camera,add the SOOSPY 1080P WiFi Camera to your cart now ! 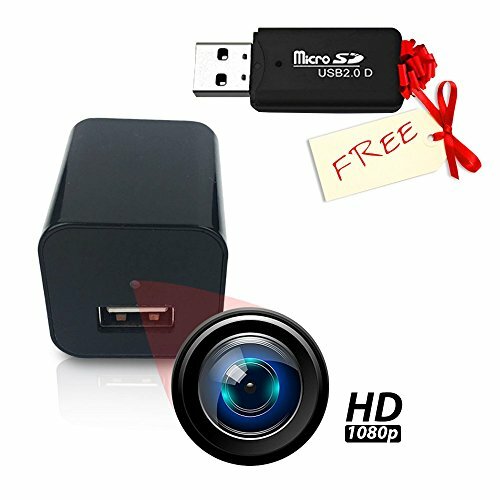 Compare prices on Spy Camera Usb Hd at ShoppinGent.com – use promo codes and coupons for best offers and deals. Start smart buying with ShoppinGent.com right now and choose your golden price on every purchase.